The new virtual centre, bringing together experts and knowledge from different sources inside and outside the European Commission, will help to tackle the root causes of food insecurity around the world. The European Commission launches a new Knowledge Centre for Global Food and Nutrition Security. 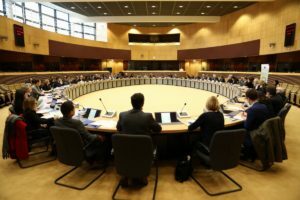 This Knowledge Centre, led by the Commission’s in-house science service, the Joint Research Centre, will act as a reference point for scientific data supporting the EU’s global commitment to end hunger, guarantee food security and improve nutrition levels in third countries where people lack access to sufficient affordable and nutritious food. Tibor Navracsics, Commissioner for Education, Culture, Youth and Sport, who is responsible for the Joint Research Centre, will launch the new Knowledge Centre in Brussels in the presence ofChristos Stylianides, Commissioner for Humanitarian Aid and Crisis Management and Phil Hogan, Commissioner for Agriculture and Rural Development. Support initiatives of the main international food and nutrition security agencies such as the Food and Agriculture Organization or the World Food Programme. The Knowledge Centre for Global Food and Nutrition Security will produce briefings, interactive maps, databases and regular reports, and will make this information publicly accessible. The Knowledge Centre will be fully funded by the European Commission. According to the Global Report on Food Crises, published in March this year, in 2017, 1 in 9 people in the world were undernourished. Due to conflicts and political or economic insecurity, sometimes coupled with extreme climatic events, the number of people affected by food crises has grown since 2016, and reached a staggering 124 million people in 2017. The Global Report on Food Crises highlighted the risk of more acute, persistent and complex food crises in the future. Implement a long-term strategy that integrates humanitarian aid, development assistance and support for peace-building, the EU supports measures to improve food and nutrition security and sustainable agriculture in over 60 partner countries. Between 2014 and 2020, the EU will provide around €8.5 billion in funding for these activities. The Joint Research Centre coordinates knowledge and competence centres, processing science-based evidence to inform policy-makers and providing tools and services for all EU policy areas. The Knowledge Centre for Global Food and Nutrition Security is the sixth to be launched under the leadership of the Joint Research Centre after those on the Bioeconomy, Territorial Policies, Migration and Demography,Disaster Risk Management and Food Fraud and Quality.